Love to rock some denim to the office but don'k think that your pair of Levi's will adhere to the strict suit and tie office dress code? 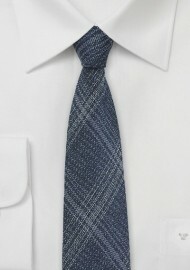 Then this trendy new silk tie featuring a denim look will be a fantastic choice. The fun color and texture is paired with a subtle plaid design. For best results pair it with a gray fitted dress shirt, a gunmetal gray narrow tie bar, as well as medium gray suit. Handmade from woven silk by neckwear brand BlackBird.